Opened on September 12th 1854, Flinders Street Station was the first railway station built in any Australian city. Melbourne Terminus, as it was called then was a collection of weatherboard sheds and on opening day, the first steam train journey in Australia left from the station to Sandridge (now Port Melbourne). By 1926, Finders Street Station became the busiest passenger station in the world, surpassing Gare Saint-Lazare in Paris, Grand Central Station in New York and Liverpool Street Station in London. On the January 11th 1922, The Argus Newspaper reported 200,000 passengers passed through the station in one day. A fixture of the station's facade, the clocks date back to the 1860s and continue to display departure times today. There was once a time when the clocks were manually operated by a railway officer who was tasked to change times on average of 900 times over an eight hour day. Now they are run automatically. This image belongs to the travel and nature stock photo library. 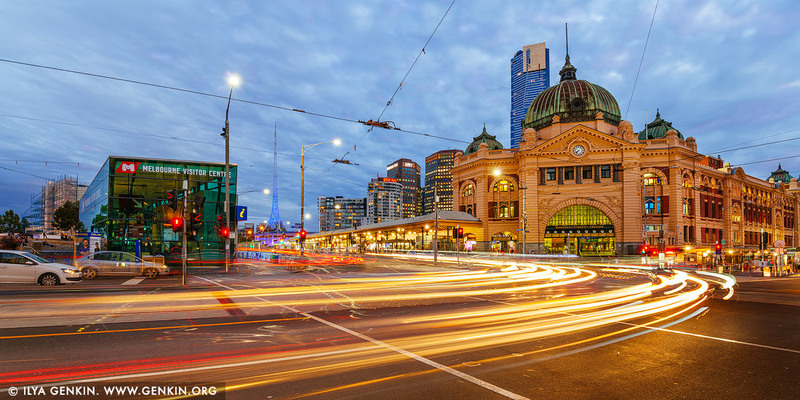 This stock photo of Flinders Street Station at Night is available for licensing for commercial and editorial uses including websites, blogs, books, magazines, brochures and advertising. Restrictions may apply for images which contain third party copyrighted material or sensitive subjects. Photos of artwork are for editorial use only. 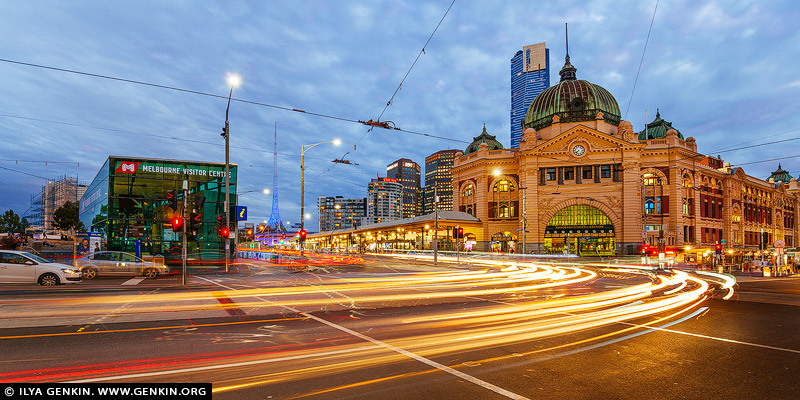 This image id AU-MELBOURNE-0032 of Flinders Street Station at Night, is copyrighted © by Ilya Genkin. This is not a public domain image.